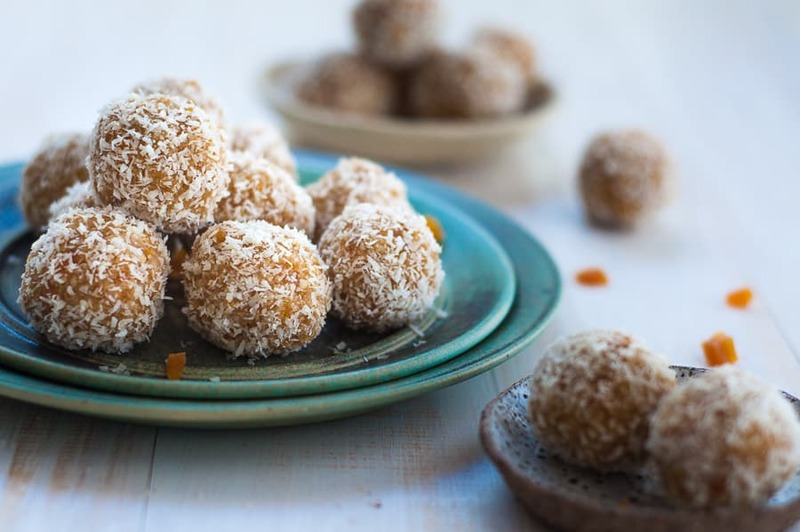 These Apricot Bliss Balls are free from refined sugar, contain just 8 ingredients, are super easy to make and are bursting with tangy apricot flavour, nutty cashews and coconut. 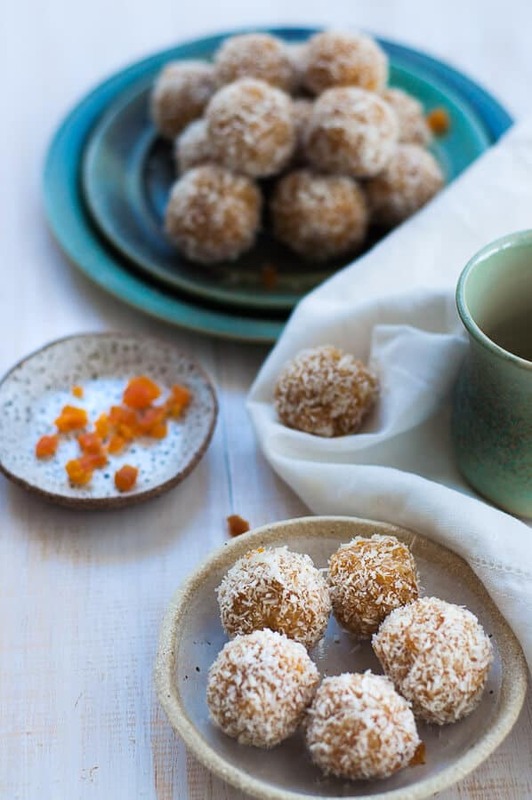 Perfect for lunchboxes, mid morning snacks, after dinner munchies and post workout nibbles, these bliss balls are the perfect portable snack. 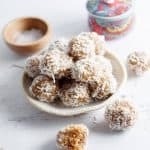 Apart from the delicious combination of apricot, cashew and coconut, I make these easy take anywhere snacks because they are so versatile. It’s a snack that wouldn’t be so weird to eat at any time of the day, for brunch, morning snack, with lunch, after lunch, before dinner, and after dinner. 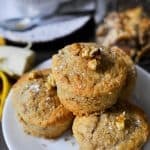 They are a much healthier option to cure the munchies, and are perfect with a cup of coffee or herbal tea. I love that they are naturally sweetened from the orange juice are low carb and each one is under 100 calories. The biggest thing though is that they are really filling, not like a packet of cookies where you have to eat half the packet just to feel satisfied. 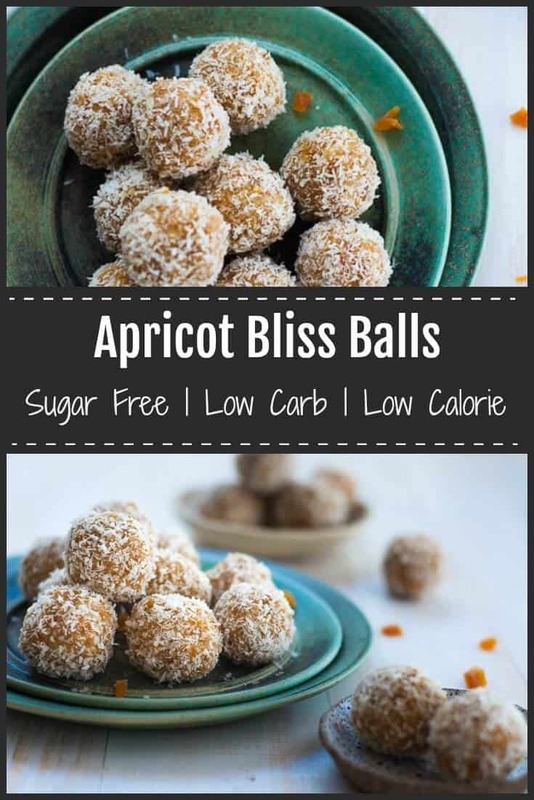 One apricot Bliss Ball will do the trick to put the hangries back in the box, and you’ll know you’ve been kind to your body by not stuffing it with awful sugars and empty calories. TIP: Fresh apricots contain natural sugars as do dried apricots, however the natural sugars in dried apricots is much more concentrated. 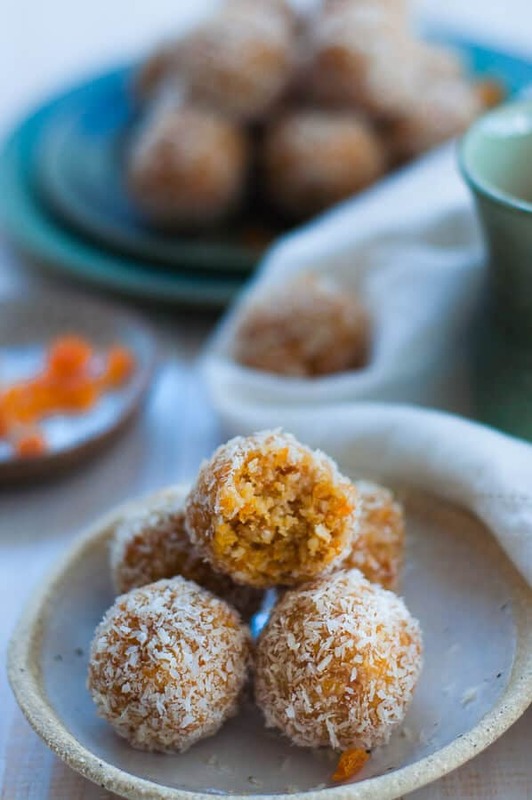 As it’s often easier to eat more dried apricots than fresh apricots, I don’t usually eat more than 3 to 5 dried apricots per day in order to keep my sugar levels under control. I love cashew nuts and although they don’t have the fibre of apricots, they are packed with nutritional value and are high in protein and good fats. 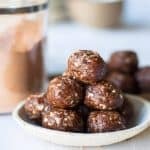 They are easy to use in no bake snacks and your high speed food processor or blender will definitely be able to handle breaking them up so they are easy to make into bite sized snacks. Unsalted Cashews are also perfect for keeping in an air tight jar in the cupboard to munch on when you’re feeling a little hungry. A handful also goes well with a nice glass of white on a Friday evening after work. Use the best quality apricots you can, it really does make a big difference. I’ve tried using different types of apricots, ie: cheap ones, but they are never as good as the ones where I have paid a bit extra for the quality dried apricots which have a deeper richer flavour. Use freshly squeezed orange juice, not juice from a bottle as that usually has additional added sugars. Use Full Fat Coconut Cream instead of the light versions. The full fat coconut cream adds to the richness and flavour. 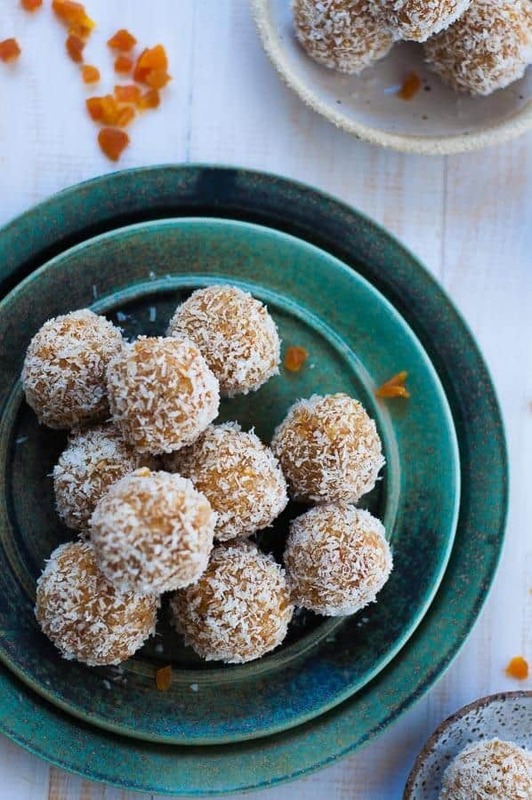 Buy Unsalted Cashews otherwise you’ll end up with a bliss ball that is not sweet enough. 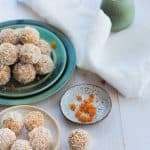 These Apricot Bliss Balls take less than half an hour to put together and provide so much goodness wrapped up in one little bite sized ball. They are fruity, nutty, creamy, sweet and nutritious. The only question is, who wouldn’t want a batch of these hiding in the back of the fridge. Prep: Store the can of coconut cream in the fridge overnight so that the cream sits on top. When you remove it from the fridge, do not shake it as you will want to scrape the cream from the top quarter of the can. 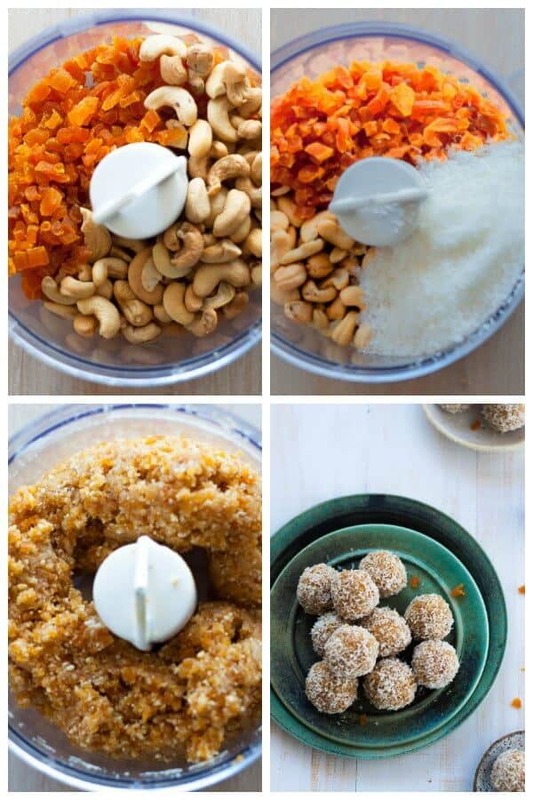 In a food processor or high speed blender, add the chopped apricots, desiccated coconut and cashews. Add the cashew nut butter, orange rind and fresh orange juice. Add 3 teaspoons of the chilled coconut cream and blitz again. Taste and check the consistency. If you want a bit more sweetness, add the optional granulated sweetener, or raw honey. Blitz again. Roll mixture into 18 ball, slightly smaller than the size of a golf ball and roll in additional desiccated coconut. Store in the fridge in an air tight container for 3 to 4 hours before eating. Balls will keep in the fridge in the air tight container for upto 5 days.